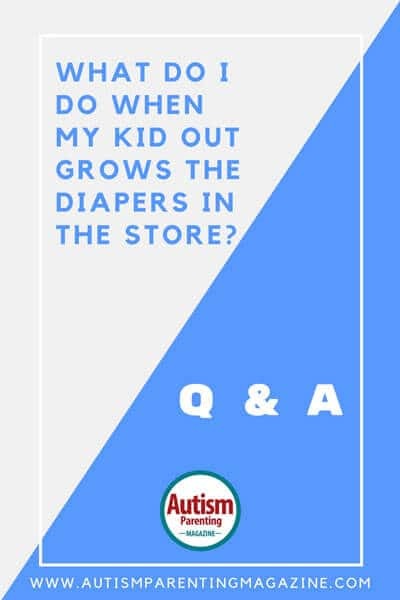 This is the question as featured in Issue Number 6 and you may also find this article on finding big kid diapers helpful. Q&A What do I do when my child with Autism out grows the diapers in the store? If your child has an ASD diagnosis, then ask your pediatrician for a prescription for big kid diapers at their three year old checkup. Most insurance companies will cover a portion or the full-price of big kid diapers for children with special needs because they are a necessity. Always keep your receipts because you may need to pay for diapers upfront and then be reimbursed from your insurance company. Please call your insurance company to check what they specifically require. Question: Where do you buy diapers in big sizes? Question: What brand/s of pull-ups are good for big kids? Answer: It seems that parents have had the best luck with the First Quality brand that makes Prevail briefs and bowers, as well as, Sleep Overs Youth Pants and Kimberly Clark’s brand GoodNites Youth Pants. Also, many people seem to have great luck with http://www.racecardiaper.com/index.html. Please note that we are not affiliated with any brands nor do we receive payment or compensation from companies. The Q&A section is based on research and parent opinions. I have an almost three year old boy with Autistic-like conditions. He is not officially diagnosed, as in Canada they try not to diagnose things before the age of 4 (not that I agree with the system here). I also have no insurance coverage or medical coverage, everything we pay for his special needs comes out of pocket. My son is outgorwing the size 6 diapers in the store and we are a single family income home. How can I get the diapers he needs without being unable to afford everything else? where can I get help? Wal-Mart online, Sells size 7 parents choice diapers. I believe 52 in a box. But it takes a week to do site to store for free shipping. If you pay for shipping it still takes about 6days. That is how I get a size 7 more My son. My son is six. I buy the parents choice size 7 diapers. Pampers also makes a size 7. You can order them online and ship to store for free. I have also started using the parents choice baby wipes. My son is autistic an i use the old fasion kind that you wash out. I just looked up incontinence medical suppliers that deliver to Canada. The internet came up with three. One was at home medical. one was called agecomfort.com. http://www.acmedi.com, http://www.healthcaresolutions.ca. My name is Karen, I am the president of our Autism Ontario- North Halton Chapter. Early diagnosis is actually something that they have been prioritizing for years. Your case worker is WRONG! Where in Canada are you? My daughter was diagnosed at 14 months old. (She is now almost 15 years old) I live about an hour outside Toronto, Ontario. You can get some funding through Easter Seals for incontinence supplies. They don’t cover 100% but it helps. I suggest you find out if you have an Autism Parent Support Group near you. You will find out so much from parents who have already had to search the system for what they need. To say they don’t diagnose in Canada until age 4 is incorrect. It is probably a provincial thing because my Grandson was diagnosed at age 2 in Alberta. I have a 9yr old autistic child. I live in Minnesota. Check out Merwin Home medical. They may ship to Canada. They are not called diapers, they are called briefs. Merwin starts with a small size and works all the way up to extra large. I may have a package of medium briefs that my son has out grown if you are interested. I have ten yr old girl. What brand briefs do you use? I live in Texas. My mom buys my diapers at abuniverse.com. they have really good absorbant pampers type diapers. My little brother is autistic. My moms uses this site for his diapers..
Abena makes a diaper that is sized for a child. I believe it is the Abri-form XS2- Extra Small. I know they are coming out with another one very soon that holds 1500ml where the Extra Small holds 1400ml i believe. I use these for my daughter and they are super soft and super absorbent. i am waiting for them to get the Junior size one that holds a little more because i think my daughter may need a more absorbent one soon. You won’t really find any “big kid diapers”. After size 6 they turn into garbage manufactured primarily for institutions and are not intended to do anything but provide the appearance of protection rather than being the product intended to keep your beloved young one dry and comfortable. The simple fact is that none of the baby diaper manufacturers want to use their technology or name on larger products, relegating them to being about 25 years behind infant products technologically and FAR behind them as far as accessibility and comfort for the wearer. After special needs kids get to be too large to be cute anymore. the industry cuts us loose and figures we’ll just learn to endure the crappy products designed to keep us locked up in our homes for the rest of our existence. my 6 year autistic girl need diapers in large size.Its very hard to get them and expencive too .Colud any one tell me what t o do? I’m fairly new caring for my 4 1/2 year old granddaughter who is mildly autistic, it has been a year and I know she will be needing a bigger size diaper soon, I also know it will take time to potty train her but would feel better knowing where to get the bigger sized diapers/briefs for her, as we live in Central Manitoba there is NO support group or any assistance to help us out. Also we are having a hard time trying to get her diagnosed, no one in this area is willing to help us out, it is frustrating but we are not giving up! I have two autistic boys ages seven and eight. It is very hard because they both wear diapers and the medical company that supplies them aren’t the best. I am constantly changing them throughout the night. I wish there were better quality diapers for are children. My nephew at 10 has outgrown all of the “kids” sizes. We get a men’s Depends incontinence pull-up at Costco or Walmart. He actually argues less about wearing them to bed because they say men’s on the package. Home Hospice that is insurance based is a prescribed diaper box that comes to your home. Our son age 9 is in size 6. Helped us. Hope this can help anyone else, because schools need the diapers not the reusable ones, and over size 6 us hard to find. There are Depends for kids that are in adult size diapers. Our daughter is 14 and has autism and we used the Pampers size 8 diapers on her,then she out grew them! We now have her in the 24×27 inch gerber flat cloth diapers pinned on with diaper pins and adult size plastic pants in pastels and babyprints.They work for her and we feel better not putting disposables in the landfills! My son is 8 years old… diagnosed at age 2 with Autism, I live in Nova Scotia . Direct family support will pay for diapers but you have to fight for it, many letters from yourself, Dr’s and phycologist that diagnosed him/her. it must say intellectual disability . My son wears good nights l/xlg. they work great! hope this helps!